Make the best of your next small group outing in Seattle by arranging for private charter transportation. We specialize in transport for groups of up to 14 people. Don't let the words "charter" or "private" mislead you. We believe you'll find our services delightfully affordable compared to other options out there. We offer several options between Sea-Tac, the Cruise Terminals, the Greater Seattle metro area, as well as long-distance transfers to Vancouver, BC or Portland, OR. 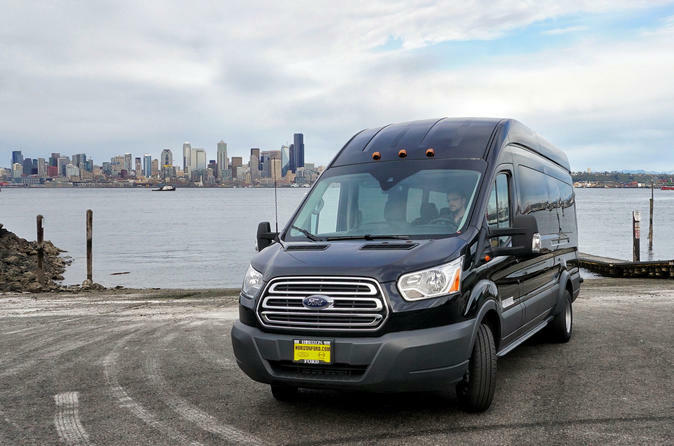 Standard 4 hour or 8 hour private charter service can start and end anywhere within the Greater Seattle Metro area and include unlimited stops and unlimited mileage. If your group would like to reserve private transport service for either 4 hours or 8 hours, we offer complimentary pick-up or drop-off at Sea-Tac or the Cruise Terminal on the same day of travel, so there's no need to reserve separate services and pay extra. If your group is looking for a long-distance one-way transfer aside from Vancouver or Portland, please select 4 Hour or 8 Hour service, depending on the duration of time necessary to complete a round-trip route from Seattle to your destination and then back to Seattle. For service that begins and ends within Seattle, duration of service is based upon the time between the scheduled pick-up time and the actual drop-off time. For one-way routes (ex. Seattle to Vancouver, Seattle to Portland, Seattle to Victoria, etc. ), service time is calculated based on the scheduled pick-up time and a reasonable estimate of the required time for the vehicle to return to Seattle. The local service provider reserves the right to collect additional fees if the actual duration of service exceeds what was originally reserved.